The history of the arrow and bow of the Turks stretches back to very distand times. In the legend of Oguz Khagan we see it taking its place either as a means of war or as a symbolic element. In Central Asia the arrow and bow, together with the sword, whether in hunting or wars was a most important weapon. The sword was used as the close range weapon and the arrow and bow as the long range weapon. With the acceptance by the Turks of Islam, as well as the importance given to arrow and bow there were added a special religious significance. From the written sources coming down to us today from the first century of Islam (we find that) the arrow and bow even more that other weapons is given a special place. In this subject we have also learned of Hazrat Mohammad many perceptive efforts. From medieval times through the nineteenth century, archers of the Islamic crescent, which stretches from Turkey eastwart to India, were renowed for both their exceptional skills and their superior weapons. And archery developed and reaching its zenith in the Ottoman Empire. Zihgir is the Turkish word for the thumb ring used to draw the bow in the Ottoman Empire. 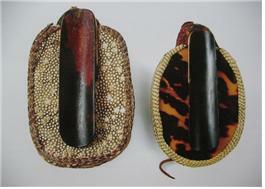 Turkish thumb rings were made of wood, metal, ivory, bone, horn or leather. These rings signified that the person wearing them was a warrior. In time they became a symbol of prestige in Ottoman society, and some later examples have so much ornamentation on the surface from which the bowstring slides that they could not be used to shoot with. Surviving examples are often made of precious metals and richly decorated. Some are carved from precious stones. The siper and majra are devices used to draw arrows past the bow's front limb where the arrow would normally rest. The siper is a type of shelf strapped to the archer's bow hand, which allows the archer to pull the bow back to extreme lengths in order to get the maximum amount of force behind the arrow. They are most commonly used for Flight Archery, to achieve the greatest distance. The Majra is a thin piece of wood with a channel cut in it and small loop for the archer's draw hand. The device allows the archer to pull back arrows that are much shorter than were intended for the bow. There is some debate among historians if this device was designed to shoot arrows that were too short for the enemy to pick up and shoot back, or if it was a way to reuse bolts fired by Chinese crossbowmen. In modern times they are primarily used in Flight Archery to shoot shorter arrows to cut down on weight. 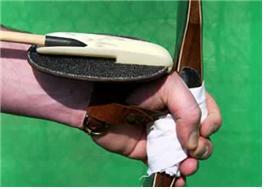 The Turkish bow is a recurved composite bow used in the Ottoman Empire. The construction is similar to that of other classic Asiatic composite bows, with a wooden core (maple was most desirable), animal horn on the belly (the side facing the archer), and sinew on the front, with the layers secured together with Animal glue. However, several features of the Turkish bow are distinct. The curvature tends to be more extreme when the bow is unstrung, with the limbs curling forward into the shape of the letter “C”. With some bows, the rigid tips of the limbs (“kasan”) even touch. The grip area is not recessed like other Asianic bows and is fairly flat on the belly, while the front of the grip bulges outwards. WTAO will save archery as world universal culture value, and try various attempts to develop this culture. Copyright © 2017 World Traditional Archery Organization (WTAO). All Rights Reserved.